Spring has sprung. Chef’s diary, new recipes. What an unforgettable weekend and a perfect introduction to the magic of spring. We had the privilege of hosting the wonderful Nina Timm in our kitchen for an amazing weekend of good comfort food, food styling, loads of techniques plus stunning photography. Not only was it a very successful workshop, it was also the perfect kick-off to the new spring season. Our garden is starting to bloom and smells fragrant. We started off our weekend class with Nina on a high note working with best quality local Karoo lamb and beef. The class baked bread and created a delicious dessert with Nina. We had an open fire barbecue and dined under the stars. Sunday morning was the highlight for me. The breakfast class was hands-on and everybody ate their own creations. We took something as simple and yummy as the classic waffle, added different flavours and textures to the batter. We played around with delicious, seasonal and fresh toppings. 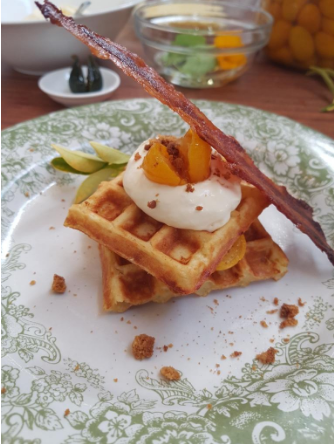 There were inventions ranging from mouth watering corn waffles with parmesan, crispy bacon and fig syrup to decadent ‘Melktert’ waffles with clotted cream, cinnamon and crumbled ginger biscuits. Whisk together flour, sugar, baking powder, baking soda and salt. In a large bowl, whisk together buttermilk, butter and eggs. Add flour mixture and mix just until batter is combined. Add corn and mix. Heat waffle iron and brush with butter. Pour batter onto iron and close. Cook for 3 – 5 minutes or until golden brown. We enjoyed cooking and sharing these dishes with Nina and the cooking class. Boil the sweet potatoes in salted water until soft. Drain and roughly mash with a potato masher. Grate some fresh nutmeg and mix in with the sweet potato. In the meantime, mix the 2 cheeses with the sour cream and keep aside. Take the mashed sweet potato and spoon into a pie dish. Spread the cheese mixture over the top, grate some more nutmeg over and bake in a hot oven until golden and bubbly. Preheat oven to 200 C. Lay the beef fillet on a flat surface and with a sharp knife make an incision all along the top of the fillet to make a packet. Open up the meat and spread the pesto on the inside of the pocket. Now lay the sun-dried tomatoes all along the middle and lastly crumble the feta cheese over the tomatoes. Cut 4 – 6 pieces of twine and bring the meat together and tie it up to keep the filling in. Rub the fillet with the oil that you drained off the tomatoes. Season with salt and pepper. Heat a griddle pan or ordinary cast iron pan on the stove and brown the meat on the all sides. Place the pan in the oven and cook for another 15 – 20 minutes, depending on how well you prefer your meat. For the last 8 minutes, grill some tomatoes and onions alongside the fillet. When the weekend was over, everything went back to normal. Spring is in the air and I feel inspired. Just outside my kitchen our loquat tree is in full swing. The birds are the happiest of all to feast on this sweet, yellow delight right from our garden so we have to move fast to get some! We decided to do this fruit justice by cooking it up in syrup and making a refreshing cordial. 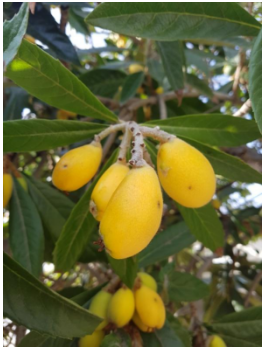 Read more about the loquat. Combine all ingredients in a pot and bring to the boil. Reduce heat, and simmer for about 15 minutes, stirring frequently and gently mashing the loquats with the spoon. Remove from heat and strain mixture through a sieve covered with muslin or cheese cloth. Gently squeeze the cloth to remove all the liquids. 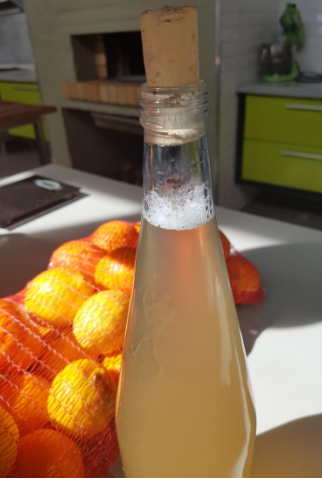 Pour into a bottle for storage and keep refrigerated. 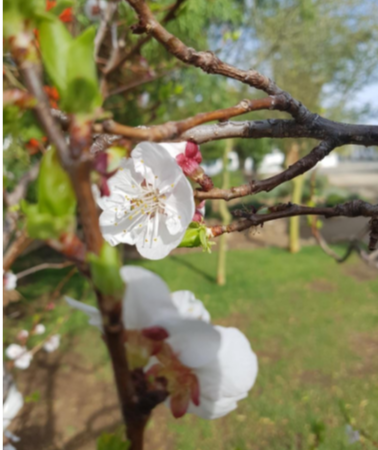 Hope to see you in our kitchen this spring and summer. Chef Jaco. I will cherish this memory for a lifetime!